Denny’s HFE Campaign & USHLI Partner to Award Scholarships! At the United States Hispanic Leadership Institute, we know how important it is for schools across the country to identify and remove barriers that prevent students from accessing the nutrition and higher educational opportunities they need to learn and succeed. According to No Kid Hungry®, 22% of U.S. children under age 18 live in poverty, struggling every day with hunger that holds them back from striving to do their best in school. 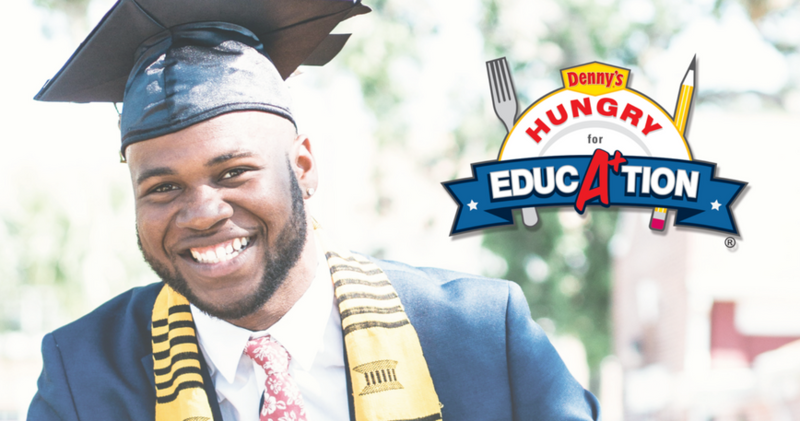 That’s why we have partnered with Denny’s Hungry for Education (HFE) campaign, a program awarding more than $200,000 in scholarships and special incentives to elementary, high school, and college students for their innovative ideas on decreasing childhood hunger. All applicants must be enrolled in an accredited educational institution (high school) in the United States or Puerto Rico. If the applicant is under the age of 18 and is selected as a potential HFE scholarship recipient, in order to be confirmed as a winner, the student’s parent or legal guardian must sign an Affidavit of Eligibility and Assignment of Rights. Scholarship funds awarded to winners must be used for education, such as tuition and related fees, books, supplies, and equipment required for courses at an accredited educational institution. Students will need to provide a 300-word (high school) or 500-word (college) essay on how Denny’s can impact childhood hunger in the United States. Students can get involved with Hungry for Education by applying for a $1,000 Hungry for Education scholarship. Previous Previous post: Submit Your Workshop Proposals for the 37th USHLI Conference!